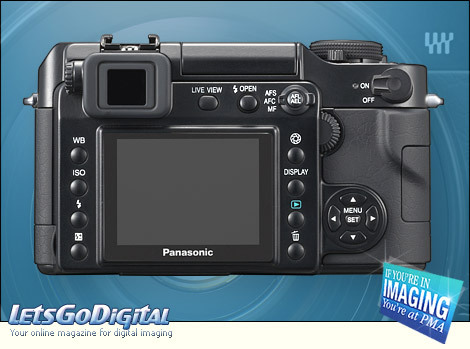 Panasonic's first digital SLR camera with interchangeable lens has been announced on the PMA. Panasonic is pleased to announce the development of our first interchangeable-lens digital SLR camera, the Panasonic Lumix DMC-L1. State-of-the-art digital and optical technologies developed for our compact digital cameras have been crystallized to make Lumix a top camera brand while helping establish a new photographic culture for the digital age. 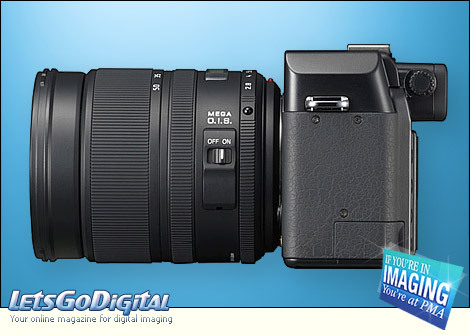 Panasonic is drawing on these leading technologies, and the emotional excitement of true-to-life photographic images, as we announced in our entry to the digital SLR market in 2005. 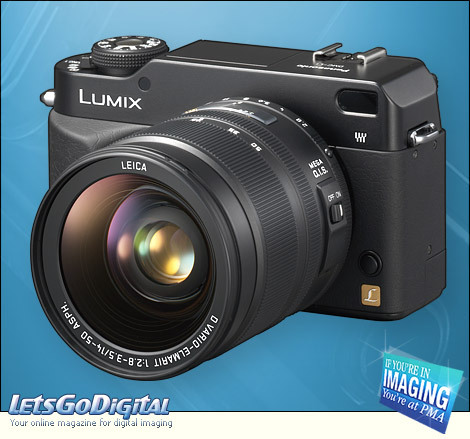 The Panasonic L1 being introduced today is an entirely new kind of digital SLR camera. Panasonic L1 SLR - 7.5 Megapixels - It is operated much like a traditional film camera but provides a variety of innovative features that increase the fun of shooting photos. While the Panasonic Lumix DMC-L1 is digital, it has a classic design that will remind users of traditional analogue cameras. These characteristics, together with a shutter speed control dial on the camera body and an aperture ring on the Leica D Vario-Elmarit 14-50mm/F2.8-3.5 lens (also being introduced), distinguish the DMC-L1 from conventional digital SLRs in both design and operation. Panasonic Lumix DMC L1 SLR - Because it is digital, the Panasonic Lumix DMC-L1 can offer features such as a full-time Live View function through the large 2.5" high-resolution LCD, which offers a shooting style different from conventional digital SLRs that have only an optical viewfinder. The full-time Live View is made possible by the new Live MOS sensor, developed using Panasonic's original' Maicovicon technology. Used in the Panasonic DMC-L1, the 4/3-type Live MOS sensor with 7.5 million pixels provides both the outstanding image quality of a CCD and the low energy consumption for which CMOS sensors are known. The DMC L1 also incorporates Venus Engine III image processing LSI, which teams up with the Live MOS sensor to achieve stunning picture quality and responsive performance, with features as rapid consecutive shooting. Panasonic Lumix DMC-L1 - Supersonic Wave Filter - The Panasonic L1 further incorporates a Supersonic Wave Filter that serves as a dust reduction system, so you don't have to worry about dust entering the camera during lens changes. The Panasonic Lumix DMC-L1 debuts as a state-of-the-art digital SLR camera that maintains the intuitive control and operability of familiar analogue cameras, unlike digital SLRs that simply offer extended functions and specifications. 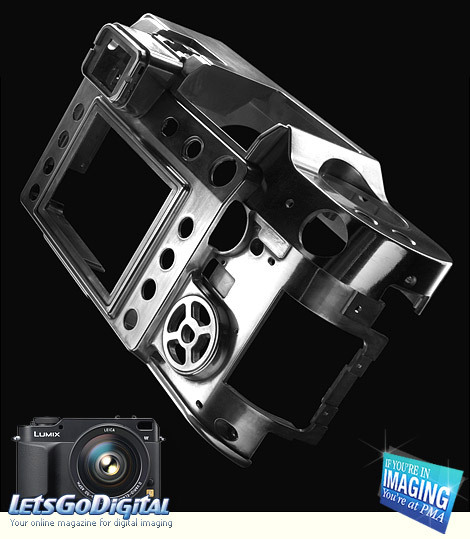 The Panasonic DMC-L1 is a finely crafted, truly satisfying camera that makes it easy for people who have never even used a digital single lens reflex camera to take beautiful shots and gives professionals a powerful tool for creating photographic masterpieces that visually express the emotions of their subjects. Furthermore, to enhance the sense of camera control, the Panasonic Lumix DMC-L1 features a shutter speed dial on top of the camera body. The new Leica D Vario-Elmarit 14-50mm/F2.8-3.5 lens (also introduced today) is equipped with an aperture ring, in addition to a focus ring and zoom ring, for easy, direct aperture setting. Panasonic Lumix DMC-L1 - Full-time Live View - By combining the full-time image output function of the Live MOS sensor and a mirror-up mechanism, the DMC-L1 achieves a full-time Live View function that displays the image on the LCD directly from the sensor signal. This function can be selected in both Auto Focus and Manual Focus modes. In Manual Focus, it allows the user to enlarge an image within the frame and then select the area focusing. This makes it easy to check the focusing condition on the large 2.5-inch, high-resolution, 207,000-pixel LCD. The depth of field can also be easily checked by pressing the Aperture button. The Live MOS sensor used in the DMC-L1 not only makes full-time Live View possible, it also helps capture the beautiful images of a CCD sensor with delicate gradation and a wide dynamic range. And it suppresses energy consumption as only a CMOS sensor can do. Noise is also minimized thanks to a special processing technology that runs on voltage as low as 5 Volt. Panasonic Lumix DMC-L1 -Venus Engine Ill - The Venus Engine III is an image processing LSI that was newly developed to maximize the performance of the Live MOS sensor. While inheriting the earlier Venus Engine's high resolution, superior color reproduction and detailed gradation, the Venus Engine III also reduces noise to the level expected from a digital SLR camera, to help render smooth images. The Venus Engine III improves camera responsiveness too, supporting high-performance consecutive shooting and a short shutter interval. Despite the considerably higher performance, the Venus Engine III consumes only 80% as much power as the Venus Engine II. This combines with the Live MOS sensor's low energy consumption to provide longer battery life. 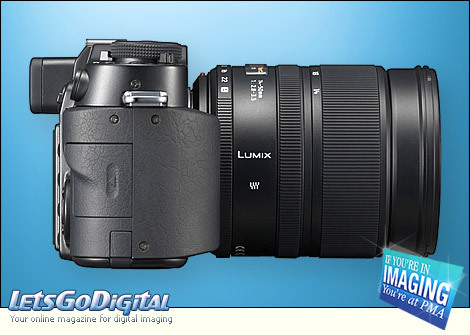 Panasonic Lumix DMC-L1 - Dust reduction system - The most critical and annoying problem with digital SLRs with interchangeable lenses is the possibility of dust getting inside the camera during lens changes, contaminating the image sensor. If this happens, professional cleaning is often required. The DMC-L1 takes care of this problem by incorporating a Supersonic Wave Filter dust reduction system. The system uses supersonic vibration to instantly shake off any dust that might otherwise affect the image. 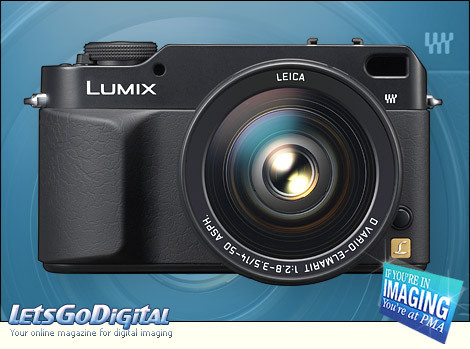 Panasonic original home networking - Like all LUMIX models, the DMC-L1 is compatible with the SD Memory Card. It also is compatible with the mass-storage SD standard based on FAT32, including the upcoming super-high-capacity SD Memory Cards of more than 2 GB (SDHC). Panasonic invites you to explore new ways to enjoy photos at home. Take shots with your LUMIX camera, view the images on a Panasonic plasma display, save them onto discs with a DVD recorder, and print them with a photo printer connected to the TV. It's all part of Panasonic's pursuit of a new photographic culture for the digital age.